Hello everyone, and welcome to another Singaporean review! This Sunday, I’ll be reviewing the Strand Reversible Briefcase from homegrown fashion label, Gnome & Bow. The Strand Reversible Briefcase in Forest Green/Olive. Current pictured is the briefcase in its “Hyde” form. The Strand Reversible Briefcase is from Gnome & Bow’s second collection, Jekyll’s Hyde. Inspired by Robert Louis Stevenson’s iconic gothic novella “The Strange Case of Dr Jekyll and Mr Hyde”, all bags from their second collection are reversible, a nod to the dual personality of the tale’s protagonist. In addition, all products in the collection are named after famous streets in London, where the original novel was set. Without further ado, let’s take a detailed look at the Strand briefcase! Gnome & Bow is a homegrown Singaporean brand specializing in “goods that tells stories”. I’ve previously wrote n in-depth about the brand in my review of their Kale Backpack – read the article here! I’ve wrote in my review of the Kale Backpack that the build quality was – for the most parts – superb. I’m glad to report that that continues to be the case with the Strand Briefcase! The Strand Briefcase in its Forest Green “Jekyll” form. Being reversible, the Strand Briefcase has two distinct looks – the formal forest green “Jekyll” look (pictured above), and the more casual olive “Hyde” look seen in the featured image. More on the design elements later, but with two distinct looks come the use of two distinct materials on the exterior. For the formal “Jekyll” look, the exterior of the briefcase is made of water-resistant nylon that is glossy and smooth to the touch. As compared to polyester, nylon is smoother (and therefore feels more premium to the touch), and is stronger and more durable. As seen in the above photo, the exterior nylon material has a glossy look, adding lustre to the briefcase. Furthermore, the nylon that Gnome & Bow uses is augmented by a PVC that allows the bag to quickly spring back to shape when crumpled. The Strand Briefcase in its Olive “Hyde” form. 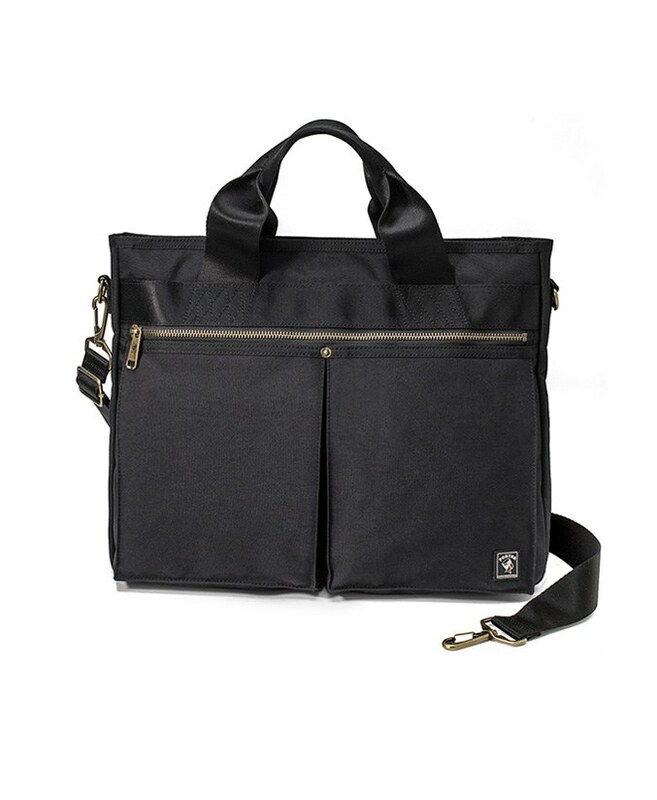 In the briefcase’s more casual “Hyde” form, the exterior is made of cotton canvas. The cotton canvas feels soft and supple to the touch, and is also coated with a water-resistant coating to ensure protection for the fabric. Full Grain U.S Cow Leather accents. The leather accents on the Strand briefcase are made of full-grain US cow leather. As I’ve covered in my previous articles, full-grain leather is considered the highest quality tier of leather, and will acquire a nice patina over time. As I’ve been using the briefcase for over a month now, one can see slight patina already developing in the above photo. Lower-quality briefcases often use faux leather in their leather accents, which will peel off and degrade over time. Overall, the full-grain leather accents adds a nice premium touch to the briefcase. In addition, one can see that the stitching is pretty nicely done as well, without any loose ends or threads coming apart as of yet. For the zippers, Gnome & Bow use YKK Zippers for the Strand briefcase. The zipping action is smooth, and unlike the previous bag that I reviewed here, I never ran into any issues of the zippers being stuck. Similar to the Kale backpack, these zippers look and feel solid and robust – I’ll be very surprised if they jam on me anytime soon. In the unfortunate even that that happens, there’s a one-year warranty on all hardware in case you run into any issues! Similar to the Kale backpack, the Strand briefcase also comes with a neoprene-padded laptop compartment that is capable of fitting 13” laptops. Given that I often bring my laptop out to write, I really appreciated a dedicated neoprene laptop compartment. When the Strand briefcase is in its “Jekyll” form, the laptop compartment is located at the back of the briefcase. In its “Hyde” form, the laptop compartment would be located on the interior. When reversed, the laptop compartment would be located on the interior of the briefcase. The handles are stitched on in a “X” formation to increase load durability. The handles on the Strand briefcase are nicely stitched on, and thus far I’ve not seen signs of wear-and-tear in this department after using it for a month. Gnome & Bow went an extra step here by stitching the handles in a “X” formation to increase load durability. However, generally speaking handles which are stitched on are less durable than handles which are bolted on for a simply reason – screws can withstand more weight than stitches! For an example of a briefcase with bolted-on handles, do read my previous review of another briefcase here. As such, while the handles shows no signs of wear as of now, I do flag it as a possible area of vulnerability. Also, the top of the briefcase lacks any clasp to hold the opening together. This means that when I pack the briefcase to the brim (I’m a heavy duty user), the briefcase has a tendency to “flare” open, and when slung on the shoulder it looks, for the lack of a better word, unglam. Often, I have to physically use my arm and press it against the backpack to prevent it from flaring open. This definitely isn’t a deal-breaker, but still it is an annoyance. However, I understand that given the need for the bag to be reversible, perhaps having a clasp fastener is not possible. I’ve reached out to Gnome & Bow, who informed me that for a fee, they can add a leather tab for securing the Strand briefcase upon email request. Nevertheless, I do feel that such a feature would be built-in, instead of a payable add-on! The side hardware is actually bolted, which is a good sign! Strangely enough, though the handles aren’t bolted, the side hardware for the strap is! This ensures that that little piece of leather tab (pictured above) holding the strap loop won’t come apart that easily, as it undoubtedly would if held together only by stitches. The strap hook is actually quite well designed, and I love the subtle brand detailing on the hook itself. The strap itself is made of thick cotton webbing, which feels comfortable on the shoulder and looks durable enough to not fray and tear in the near future. Overall though, I feel that similar to the Kale backpack that I’ve reviewed previously, the Strand Reversible Briefcase continues Gnome & Bow’s dedication to the usage of premium materials in their goods. While the Strand Briefcase is certainly well-built, I believe that the design of this briefcase is ingenious, and is the true star of the show here. The formal and composed side of the Strand backpack. Let’s start with the “Jekyll” side of the bag. Like Dr Jekyll in the fable, the Strand Briefcase in forest green looks sleek, sophisticated and composed. As aforementioned, paired with the full-grain leather trimmings the briefcase oozes class and style. Yet, unlike the previous briefcase I reviewed earlier, I find the styling of the Strand backpack (in its “Jekyll” form) contemporary, something refreshing to bring to the office. Compared to the Picard/Aldo/Pedro briefcases that I see many white-collar workers carry, the Strand backpack stands out. The Gnome & Bow logo. Furthermore, I find the logo is nicely designed as well. In addition to the fact that it’s constructed out of full grain leather, the leather piece is hand-stitched onto the backpack with Oxblood threading. As I mentioned in my review of their Kale backpack, this is one of their design trademarks – you will find hand-stitched Oxblood threading in all of Gnome & Bow’s bags and wallets. To Gnome & Bow, the Oxblood color conveys elegance and class. Most brands just emboss their logo or print their logo on fabric swatches and stitch it to the backpack, so I like that Gnome & Bow upped the ante in this aspect! Hand-stitched Oxblood threading on the base of the Strand briefcase. At the bottom of the briefcase, one finds a quote by either Jekyll or Hyde, depending on which form the briefcase is in! The base/bottom of the briefcase is constructed out of full-grain leather, which when scuffed up (like in the above photo) demonstrates its character. In addition, the trademark red Oxblood threading extends to the corners of the base as well as the handles! The briefcase’s “Hyde” personality yearning to be released. At the bottom of the briefcase’s interior, you will find the leather base of the briefcase embossed with the words “Let me out!” (when the briefcase is in the “Jekyll” form), presumably spoken by Mr Hyde. I really like this design element. I find the expression of the idea that the briefcase has a repressed identity conveyed smartly and elegantly here. The words are symbolic too – after a long day/week at work, and after unloading the briefcase of your work items, the quote compels you to let the your hair down and your wild side (metaphorically represented here by Hyde) out, reverse the briefcase, and go out and have fun. It’s a good reminder to maintain work-life balance, and to let our inner frivolousness out – we all have a Hyde inside us, and sometimes its important to let it loose! The Strand Briefcase in its “Hyde” form – wild and carefree. Reverse the bag, and the Strand briefcase reveals its casual and fun side. With its uniquely patterned exterior, I personally find this version of the briefcase my favorite as it became my go-to briefcase for the weekend. I think this is perhaps because my inner rebel connects with the “Hyde” personality of the briefcase – like Hyde, my personality is more whimsical and devil-may-care. The Maverick print on the exterior. The Maverick print is what attracted me the post about the Strand briefcase. There’s a Victorian vibe to the patterns and motifs which tugs at my heartstrings. Gnome & Bow states that they designed the Maverick print in-house to “showcase elements of risk and non-conformism”, which totally resonates with the rebel in me. Each motif on the Maverick print was hand-illustrated by the design team over at Gnome & Bow, before being tastefully pieced together to form a unique pattern. I absolutely adore the whimsical and playful nature of the design! The logo of the collection the Strand briefcase belongs to. On the exterior of the briefcase is a leather tab depicting the collection the Strand briefcase is from. Similar to the logo, the collection tab here is too made of full-grain leather, and is hand stitched with Oxblood treading onto the bag. I think the design of this leather tab is quite ingenious as well, with the leather patch resembling a book cover! Similarly, reverse the briefcase and you will find a quote by Dr Jekyll at the bottom, gently reminding you that it’s time to get back to work. I really like the design touch of the reversible bag bottoms, as I feel it really illustrates the split personality of the briefcase smartly! Overall, I love the design of the Strand briefcase. When Quanda first explained the concept behind the Strand briefcase to me, my jaw literally dropped. One reversible bag, two distinct designs to illustrate the conflicting (actually, some might argue complementing) personalities of Jekyll and Hyde – it is design genius. The reversibility works like a charm too – nothing looks out of place either way, and each look has its own character. The Strand briefcase in Gnome & Bow’s second collection really takes the storytelling elements of the bags to another stratosphere. Given that I compared the Kale backpack to a Porter backpack in my previous review, I thought it was only fair that I compare Gnome & Bow to Porter again! The Porter Nine 2 Five briefcase, priced at $329. In terms of build quality I do think that the Strand briefcase beats its Porter counterpart. The cotton canvas/nylon exterior/interior of the Strand briefcase looks and feels more premium than the simple plain fabric interior/nylon exterior of the Porter briefcase. Furthermore, the Strand briefcase is accented by full-grain leather detailing, something noticeably lacking on the Porter briefcase. Furthermore, the Porter briefcase lacks a dedicated neoprene laptop compartment, something I personally cannot live without now as I bring my laptop out almost everytime. That being said, I find the bronze zipper on the Porter briefcase a nice vintage touch. From a design standpoint, I have to say that the Strand briefcase takes this contest hands-down. Nothing wrong with the styling of the Porter briefcase – it’s clean, minimalist, with a slight vintage demeanor. But unlike the Strand briefcase, its design isn’t innovative or unique. The storytelling element of Jekyll and Hyde really shines through in the Strand briefcase, resulting in a briefcase that dons a different persona when reversed. As aforementioned, I really like the details in the Strand briefcase as well – from the leather detailing and Oxblood treading to the Maverick patterned canvas, there’s something whimsical about the Strand briefcase’s design that resonates with the non-conformist in me. Finally, I believe that the Strand briefcase is the better value proposition as well. Currently on sale for $242 SGD (after promo code below), the Strand briefcase – despite having better quality materials and a more innovative design – is significantly cheaper than the Porter briefcase. Furthermore, with the Strand briefcase you’re essentially getting two briefcases for the price of one – a formal work bag during the weekdays, and a casual debonair weekend bag when you’re off work. As such, I believe the Strand briefcase from Gnome & Bow to be the winner in this shootout. Conclusion: so the Gnome & Bow Briefcase “shiok” or not? Definitely. Not only is it mostly well-built, the design of this briefcase is simply ingenious. I cannot fathom the amount of design prototyping this briefcase had to go through in order to ensure that the briefcase not only looks good, but retains its functionality as well when reversed on both sides. In my opinion, the Gnome & Bow line of reversible bags exemplifies their dedication to storytelling elements the best – the essence of the iconic tale “Dr Jekyll and Hyde” is captured beautifully here, and as a literature nerd, I can’t begin to tell you how much this appeals to me. The quotes on the bottom of the briefcase, that in-house designed Maverick canvas – all of the elements blends well together to create a briefcase that truly tells a story. I really think that this briefcase is brilliant. As aforementioned, I’m happy to announce that I’ve partnered up with Gnome & Bow to offer exclusive discounts for Wahsoshiok readers! Simply enter the promo code “WAHSOSHIOK” upon checkout on their web-store to receive 10% off store-wide! After the promo code, the Strand briefcase would be available here for only $242 SGD, which in my opinion is an absolute steal considering its quality materials and the amount of design effort that went into its conception. This briefcase really wowed me, and I can’t wait to see what storytelling magic Gnome & Bow will weave into their products next! View Gnome & Bow’s complete collection here. Yes – in addition to making storytelling bags, Gnome & Bow offers storytelling wallets as well! Pictured: The Treville Coin Billfold. I have to say, I think their wallets are gorgeous. The particular wallet (The Treville Coin Billfold) is made out of a mix of full grain and cross grained full grain leather, which means that it will patina nicely over time, giving the wallet a rustic, aged look. On the inside, Gnome & Bow elected to use herringbone lining to add a touch of class and panache to the wallet. As with their bags, Gnome & Bow wallets are also hand-stitched with the brand’s iconic Oxblood treading at the corners. Overall, their wallets looks and feels really nice, and in my opinion would make for a great gift to a close friend/loved one! You can choose to personalise the wallet too! In addition, Gnome & Bow offers you the chance to personalise your wallet (for an additional fee). If you’re (like me) the type who likes personalisation, this would be a great way to make the wallet your own! “One for all, All for one”. Similar to their bags, all Gnome & Bow wallets features storytelling elements as well. For this particular wallet (The Treville Coin Billfold), it belongs to Gnome & Bow’s third collection, the 4th Musketeer – the brand’s spin on the iconic tale “The Three Musketeers”. In this wallet, the storytelling element presents itself in the form of a debossed French quote “Un pour tous, tous pour un” – One for all, All for one. A shoutout to Gnome & Bow’s beautiful wallet packaging! I usually don’t comment on the packaging, but I have to say the packaging that Gnome & Bow wallets come in is simply beautiful and brilliant! Shaped like a book, one throws back the cover to reveal the treasure (wallet) inside! What ingenious product packaging. Gnome & Bow wallets starts from as low as $65 (before discount), and remember the promo code “WAHSOSHIOK” nets you 10% on the wallets too! Click here to view their full range of wallets. Update: The Strand Briefcase is no longer available, but Gnome & Bow just released a new line of Jekyll’s Hyde Briefcases! Read my review of them here.